Only the strongest will surv-ey. This pair came into being as I’ve already painted iconic archaeologist Indiana Jones for the project, and it’s made me want some more Warhammer 40,000 excavation personnel. Theodolitus is an Adeptus Mechanicus Ruin Priest (not to be confused with the Rune Priests of the Adeptus Mechanicus or Space Wolves), specialising in archaeological investigation. You can see from his hunched back and tattered trousers that Theodolitus has spent his entire career painstakingly trowelling back trenches hoping to uncover archaeotech secrets and alien artefacts from ancient times. He is a very different adherent of the Cult Mechanicus to the Tech-priest Enginseers normally seen repairing machinery mid-battle; Theodolitus only works on battlefields abandoned centuries ago. Actual warfare – he wouldn’t touch that with a ten foot pole. Check out the holstered trowel added to the Ruin Priest’s belt. Theodolitus is a minor conversion of the standard RT601 Adventurers Tech-priest. I replaced his staff with brass wire, but kept the original top with its 1980s Adeptus Mechanicus wing symbol – simply flipping it backwards and adding a ball of putty painted like a survey lens. On the back of his belt I added his trusty archaeology trowel – “Trenchbane” – made from a diamond of plasticard, a length of wire, and putty. Theodolitus recording an ancient battlefield containing wreckage of an original Mars Pattern Warhound Titan. Battle Brother Groma has been temporarily requisitioned by from the Crimson Fists Chapter to serve with the Explorators of the Adeptus Mechanicus. 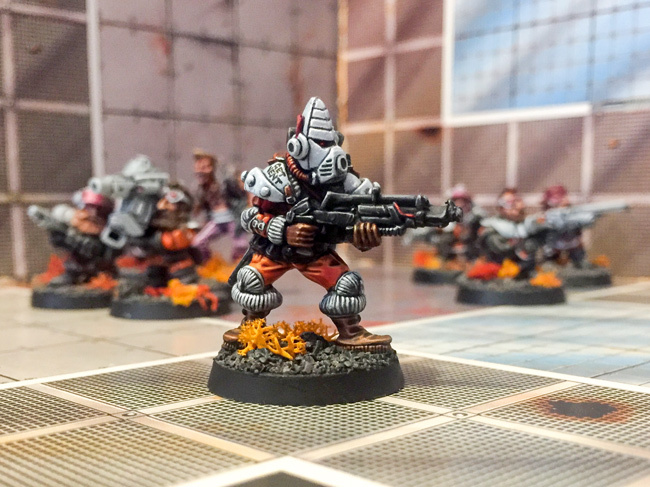 Groma served in his Chapter as a Fire Support Specialist, relaying the coordinates of the rocket strikes of the Crimson Fists’ Whirlwind formations. He is equally at home operating the las-survey devices of the Adeptus Mechanicus to record their archaeological digs, though it took him time to adjust to the tedium of measuring points on a landscape without witnessing their fiery destruction seconds later. Groma’s graffitied survey case and his freehand Crimson Fists Chapter icon. I converted Groma from the biker-with-scanner torso from the 1980s Space Marine bike range. His legs are a mongrel of metal biker legs and RTB01 plastic legs. The tripod is plastic rod, and bits box spares. The toolboxes with dinky padlocks are courtesy of Ramshackle Games. I decided on Crimson Fists colours as it’s the iconic Rogue Trader look, and it might lead in to a Battle at the Farm project later in the year. I experimented with several different blues, trying to keep him away from the Ultramarines Blue as seen on my Rogue Trader Marneus Calgar, settling on a mix of Citadel Mordian Blue, Citadel Mechanicus Standard Grey and Vallejo Royal Purple. The key to a classic Crimson Fists scheme is staying away from white and gold, and getting in a lot of crimson. Groma sometimes imagines Theodolitus and his sodding pole obliterated in a storm of rocket fire when he glimpses him through his sights. 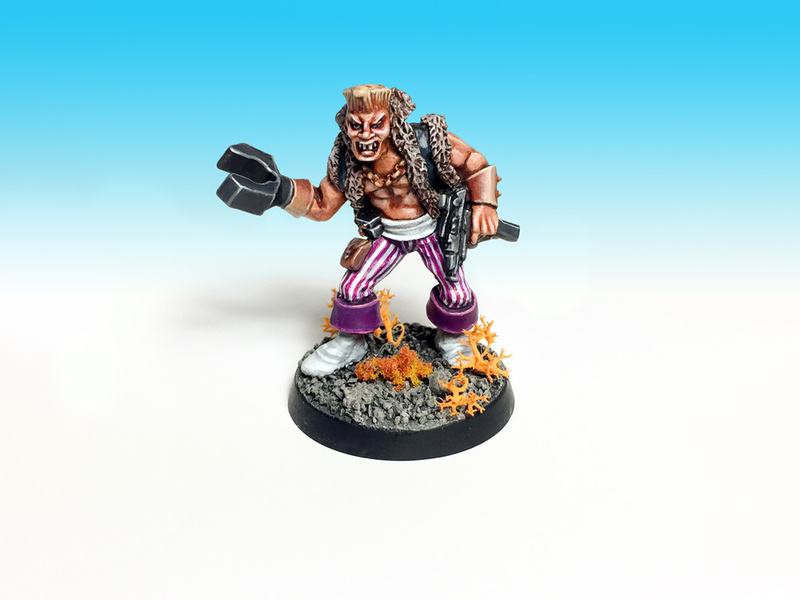 Check out sho3box for the next thrilling Rogue Trader miniature! You can find a selection of the other Choose Your Own Adventurers episodes below. Absolutely brilliant! Trench Bane and Theodolitus made me chuckle. Now that would be patently awesome! Lovely project here. Well done! This is just incredibly too good honestly. The ideas, the way it’s been done. Perfection. Now the inner surveyor in me can’t help but notice only beginners install their station so low and have to bend to look in it but hell, what do I care at this stage of excellence. Thanks! But if Brother Groma used his surveying equipment like you, JB, do then he’d spend the whole day peering through the windows of the hotel over from the office. This is brilliant. Trenchbane made me LOL heartily, ad did the tremendously RT ‘Lord of all I survey’ on the trunk. My hat is off to you. Thanks! The name “Trenchbane” is actually borrowed from my own long-suffering trowel. AJ has called hers “Wormsplitter”. Excellent. Why should only power-axes and daemon swords names? It’s not rock-star decapitations and the like, but trowels work hard too. Absolutely wonderful! Seeing the mundane stuff make me want to do comics with my civilians just doing normal everyday stuff, while combat is raging around them. Thanks Grove! More comics with news reporters getting blown up, please. Surveying Techpriest? First time I’ve seen one of those. Brother Groma with his tripod of accuracy? Nope, not seen one of those either. Dinky little trowels and padlocks – I think they’re new as well. Bountiful layering of details has resulted in a delightfully off-beat, but utterly believable pairing. They can come and survey my soil stockpiles any time! Thanks axiom! I want to push the idea even further with some survey servitors. Or “Survey-tors” as they shall henceforth be known. I’ve never seen anything like this before, but I love it! Utterly absurd, but they’ve got so much life and character that they’re completely believable. Your technical skill is enviable as well, great work! Thanks Ross! I’m currently working on some more slightly-relaxed Fists. I love the crimson fist marine! Did you freehand the chapter insignias? Thanks! Yes, the insignia is freehand. Transfers on curved shoulder pads are always a nightmare, even with microsol and microset. Hahaha!! You made my day with these. Archaeologic topography is quite a serious business! Thanks! I might get a smoke machine next to add extra atmosphere. That would be going the extra mile! I should try that with dry ice from work… usually I’d just Photoshop in effects like that though. I’ve tried photoshopping in smoke before – it’s difficult to make it work when you’ve got a 3D surface to hug. Great work–I love the classic Crimson Fist and you’ve done a great job, particularly on the icon! Ta! See if I can keep up the freehand being a recognisable fist over an entire combat squad. These turned out great. One of the things I really need to work on is getting a set up for scenic shots. I technically have all the stuff I need. I’m just a slob and have to excavate everytime I need to switch from painting to photography. It’s an effort clearing the table and setting up a miniature world, but I like to pretend while I do it I’m a god building the universe. 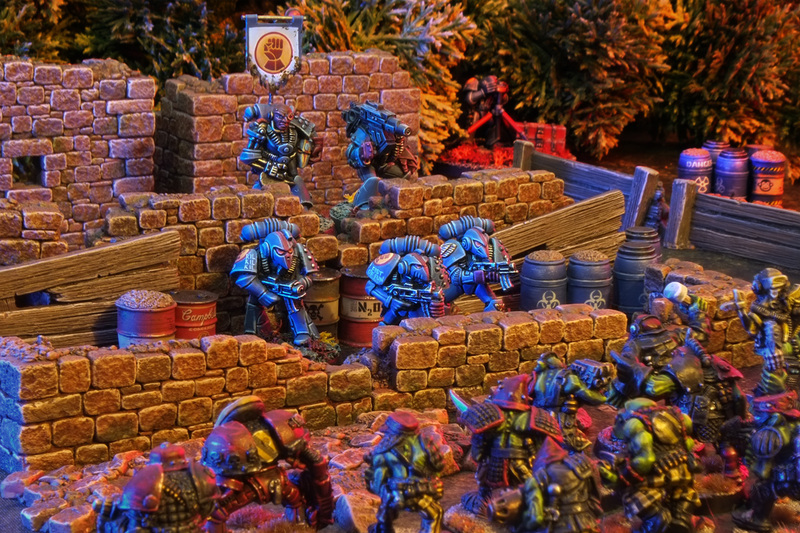 Great work here – and a real inspired use of a pair of classic models. I’m tempted to find that old Tech-priest and repaint him now! Hah! I didn’t whine about it in the original post, but he’s actually a difficult model to paint. He’s got a lot of rough areas on the sculpt where you can see, in the metal, the joins between the putty balls the original sculptor made.